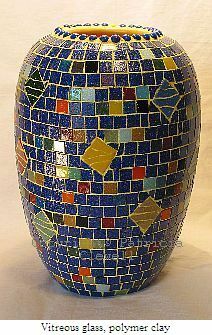 A mosaic candle holder is one of those mosaic projects that I have never personally done before meeting wonderful people in the mosaic art field. What better way to reuse old jars or an unused flower vase. For a unique gift for yourself or someone you love use different sizes while staying in the same color theme. Another idea is to use colors to represent the different holidays. For example red and clear for Christmas or Valentine's Day, fall colors for Thanksgiving, orange and black for Halloween and so on! Now gather all of your materials, tools and accessories. I have said this many times about making mosaics, use what you already have. Keep that spaghetti sauce or canning jar for your vase base. Use mismatched glasses for your candle holders. 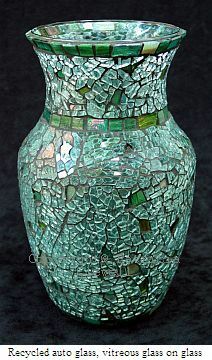 For your tesserae you can use just about anything, left over tiles, vitreous glass or even pieces of a broken car windshield make superb effects from the candle light! A good practice is to start from the top and work your way down. To glue your tesserae on the glass I recommend either a clear silicone or hot glue. These adhesives will form a quick bond stopping your tesserae from sliding down. A very important note here is if you work with silicone make sure you are in a well ventilated area, as silicone has a strong odour until it has cured. Leave about 1/8 inch spacing between the tesserae for your grout. To help you position the tiles the way you want you can use a craft stick. When you are finished let your mosaic tiles dry overnight before applying the grout. 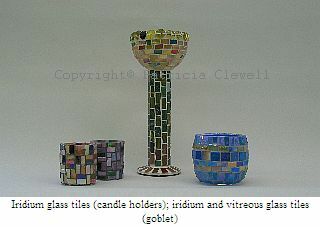 Apply the grout with a trowel or use your fingers to spread the grout evenly around the vase or candle holder. Make sure you use the proper safety equipment such as gloves if you use your hands because grout is very corrosive. Wipe clean with a damp sponge and let it dry for at least 24 hours again. 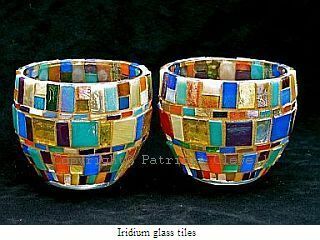 Once your grout has dried you are now finished and can place your new mosaic candle holder or mosaic vase on your dining room table as a beautiful center piece or offer as the perfect gift! Once again I would like to thank Patricia Clewell for these beautiful one-of-a-kind mosaic art pieces.